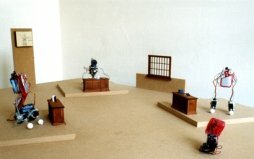 Small robots as actors enact court TV as an absurd theatre. The installation poses the question how the re-telling of the stories, which are enacted in the fictional worlds of television, changes our perception of them. The installation attempts a critique of the idealized self-conception of talk shows in the afternoon TV program and in the larger frame analyses instance of the society of the spectacle. Five small vehicles stage the absurdities of afternoon Court TV shows in a diorama. It deconstructs the TV format of the court TV show through exaggerated positive affirmation. The words spoken by the protagonists – judge, attorney, defense lawyer, defendant and witnesses – are transcribed, isolated and transferred to the computer from real TV shows. The stereotypes and absurdities of these texts are the basis for the dialogues of judge, attorney, defense lawyer, defendant and witness. A text2speech software transforms these dialogues into voice files and transmits them to small talking robotic vehicles. The vehicles operate in a film set of sorts, a diorama made out of MDF on a scale of 1:20. It consists primarily out of the following miniature objects: windows, tables, small books and pencils for judge, attorney and lawyer. “The defendant Wolfgang Günther is sentenced to a fine of 2600 Euros on account of the formation of an armed group. The defendant is obliged to carry the costs of the proceedings.” These are the sentences the audience has waited for – in the courtroom and at home in front of the TV: the defendant gets what he deserves. In this case he took justice in his own hands in his home town and established a vigilante group armed with baseball bats in order to “keep the streets clean”. These and similar problems are solved daily on German television; a program genre experiences a boom most people would not have expected. “Barbara Salesch”, one of the most popular shows, first started presenting rather boring – though authentic – cases in the form of an arbitration court, but soon developed its concept towards fictionality. No longer the show deals with real everyday problems, but it examines simulated, though “truthful”, issues as entertainment fodder for an ever growing audience.